Scars on the landscape—what is to be done? A couple of days ago I wrote that echoes of the Holocaust pervade the present, and then I regretted posting that. I didn’t mean to imply that it Is front of consciousness for most everyday Poles, because I don’t think that is true. Then I attended a session on Thursday, the last full day of the conference, that put my half-formed idea into eloquent, even poetic expression. Jakub Nowakowsky, director of the Galicia Jewish Museum in Krakow, is not Jewish, but he has made it his life’s work to study the forgotten sites of Jewish life in the region of the former Galicia, which constitutes the southern tier of Poland and the western portion of Ukraine. His talk was based on the core exhibition of the museum, which recalls the diversity Jewish life that once flourished in hundreds of Galician villages and cities and which was snuffed out in the Holocaust. His theme was the absence of memory and the physical spaces that represent what is painfully missing from the modern Polish world. Synagogues repurposed as shopping malls. Cemeteries desecrated and unrestored. Mezuzahs stripped from doorways leaving traces in the peeling paint. Unmemorialized killing fields where people now walk their dogs. These, he said, are scars on the Polish landscape and in its collective psyche. “Sometimes it is nothing that tells you something,” he said. “Here there was a polyphony of Jewish life—a diversity of flavors, tastes and noises. It was not one common experience, until the end when rich Jews and poor, observant and not, educated and unschooled all met the same fate. But history does not end in 1945 at Auschwitz, he continued. Today, there is a revival of Jewish life in Krakow, Warsaw and other big cities, but it is a shadow of the vibrancy that was. 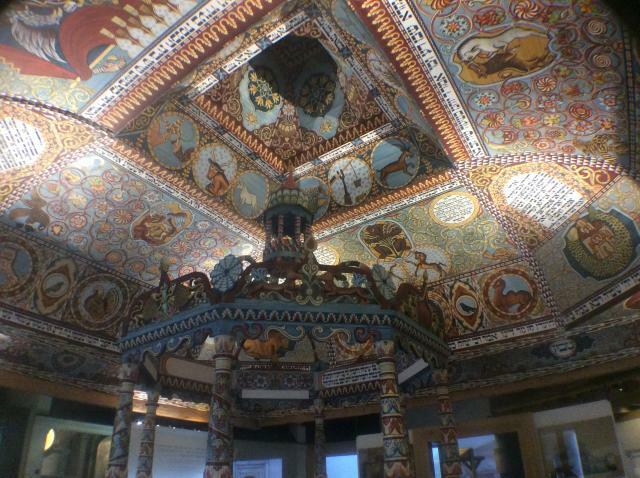 Krakow in particular has become a tourist destination for Jewish heritage, a type of commercialized Disneyland. The major issue confronting Jews and Poles alike is what is to be done with these forgotten sites of history. In most cases they are in places where tourists will never visit. They should not be built over, but should they be restored or preserved as ruins? How should they be memorialized? How can surviving Jews who want to restore a cemetery, for example, do so with participation from the local population, and not just “parachute” in and out? Nowakowski says that Poland does not have a national policy, and that every locality makes its own hard decisions. He believes this is as it should be, because it puts the responsibility for memorialization on the local people and their children to recognize what happened and to account for it. The good news, he concluded, is that in many places Poles are beginning to recognize that the history of the Jews is their history, too. Instead of turning their heads, they now have the opportunity to embrace the commonality of the Jewish and Polish experience before, during and after the Holocaust. For me, this moving session wrapped up many of the ideas and issues raised during the course of my week at the IAJGS conference. I decided to skip the extra-cost closing session in favor of some final interactions with other attendees, including an American-born Berliner and an Israeli couple—both with amazing genealogical stories. My week at the IAJGS in Warsaw had come to an end. Next August, the conference returns to the U.S. when it convenes in Cleveland, Ohio. One of the challenges in researching family history in Poland and Eastern Europe is understanding the constantly changing political boundaries in the region throughout the centuries. The same locality where your family lived was likely governed at different times under different monarchies and empires. This affected customs, language, laws—just about everything that defined your ancestors’ lives and circumstances. In my family, three branches that originated only a few hundred miles from each other (all within the boundaries of present-day Poland) were subjects of three different empires—Russian, Austrian, and Prussian-German. The political and cultural differences in three localities entirely determined their differing attitudes and life decisions—differences that continue to have an impact right down to the current generations. Several IAJGS conference sessions this week have focused on the constantly shifting map of Eastern Europe, helping researchers place their families in historical context. Two sessions by Hal Bookbinder focused on the entire history of the region from the Middle Ages to the 20th century. Another by Marysia Galbraith zoomed in on the critical years from 1772 to 1795 when the Polish lands were partitioned in three separate land grabs by the surrounding empires, until the sovereignty of Poland ceased to exist until it was reconstituted by the Treaty of Versailles after World War I. My Prussian ancestors, whose towns I will be visiting in a few days, grew up as assimilated German citizens with less religious identification and greater economic opportunity. My Austrian relatives also ended up in Germany but with much closer connections to their shtetl past, which was reflected in their stronger religious practice and support of Zionism. My Russian relatives emigrated from the region two generations earlier and brought with them all the trappings of Jewish tradition reflected in mainstream American Jewish culture. When my parents were married in 1947, my high-brow Prussian born maternal grandmother had to swallow her pride to be joined into my father’s family of so-called Östjuden, eastern Jews. Such combinations happened commonly in America but were exceptions in Europe. The two sides of my Russian family came to New York in separate waves of immigration in the 1870s and 1890s. The family story is that my father’s maternal grandfather Abe Ratner left Russia in the 1891 hidden under a bed of hay in order to escape conscription. I have not seriously investigated this possibly suspect legend so far in my research, but several sessions have given me some avenues to work on. One particularly useful session by Professor Ruth Leiserowitz looked at gazette notices from the city of Kowno in 1843 to discover the many ingenious methods used by families to enable their sons to evade conscription. We’re going to have to talk about it. The Holocaust. It happened here 75 years ago and it still pervades the place. Nobody seriously contests the facts: 3.5 million Polish Jews perished, including the 450,000 who were killed when the walled Warsaw ghetto, smack dab in the city center, was liquidated in 1943. It happened because of the evil policies of the Nazi party in Germany, but many Polish citizens participated and most others looked the other way. A few took action at great risk to themselves and their families to rescue Jews. Equally true, the Polish people also suffered terrible losses, both by the Germans during the war and under the brutal repressions of the Communist regime that ruled the country for the 40 years following. Many Poles of Jewish extraction supported communism. and some of these played leading roles implementing Stalinist policies. What is a matter of never-ending debate and recrimination is the reckoning of responsibility. Counter narratives from every sector of society —by Jews and Poles, by disparate layers of officialdom, by opposing factions within the Catholic Church, and by intellectuals and the man in the street—reverberate to this day. Six months ago, the current nationalist government under Prime Minister Mateusz Morawiecki promulgated a controversial new law criminalizing words or actions ascribing any degree of collective responsibility to the Polish people. A worldwide outcry ensued, including a move, later rejected, to relocate this conference out of the country. Just a few weeks ago, a new agreement between the governments of Poland and Israel resulted in modest changes to the law that has defused the controversy, at least for now. Professor Anatoly Polonsky, the conference scholar in residence, gave his penetrating analysis of the history of the responsibility debate in Poland, Lithuania and Ukraine during his major address to the conference on Tuesday evening. He expressed discouragement that after earlier periods of liberalization and self-examination, the current moment sees populist and nationalist tendencies on the rise, especially and surprisingly among the young generation of Poles. However, Polonsky finds hope in the work of scholars and reformers that the long arc of history will bend toward toleration and pluralism. As an outside distant observer, I have little to contribute to the debate. However, I can do my part to commemorate the original sin. There are many wonderful resources for Holocaust research in Warsaw especially the Emanuel Ringelblum Jewish Historical Institute named for the author and social worker who chronicled the unfolding tragedy in Warsaw between 1941 and 1944. Documentation and material objects that he and others in the Oneg Shabbos group collected were buried before the final destruction of the ghetto and were partially recovered in the aftermath of the war. These form the basis of the JHI’s collection, that also includes vast resources of records and documentation about the history of Polish Jews before, during and after the Holocaust. There are also those organizations from around the world who memorialize Holocaust victims that are represented here. The Israeli memorial authority, Yad Vashem, which maintains the definitive list of Holocaust victims, is at the conference to solicit new testimonies from the high percentage of conference attendees whose families were impacted. The stories of several of my relatives are already well documented in the Names Database, but just last week I learned of a previously unknown relation, Amalie Katz, the cousin of my great grandmother, who was deported from Berlin in 1942 and perished at Treblinka, the death camp located 60 miles northeast of Warsaw. Amalie is listed in the database, but only because her name was given on a Nazi deportation list. Based on my research, I can add significant new details about her and her family history that will help to bring life and memory to this otherwise forgotten individual. Before I leave this week, I will assemble my information about Amalie (so far I have no photograph) and make an official submission to Yad Vashem. One of the best things about these Jewish genealogy conferences are the special interest group (SIG) meetings. They are based on geographies, and families being what they are, most attendees are interested in multiple SIGs. I am looking forward to the Belarus, French and German SIG meetings later in the week, but already I’ve attended the Latvia, Danzig and Galicia meetings. The Latvia group drew about 25 people and had a lot of energy, having recently been revived under a new leadership team. One of the highlights was a presentation by a representative of FamilySearch.com, who shed light on the complex web of relationships between companies, organizations and countries involved in records scanning and indexing. Because of these collaborations, a lot of new records are likely available for my family from Rezekne since I last worked on that branch. The Danzig/Gdansk SIG meeting was even better. Here there were just four of us along with the SIG leader Logan Kleinwaks, who is a minor celebrity in the Jewish gen world. He heads numerous projects across a wide range of subjects, and has run the Danzig group for some time. Logan was a font of fast-talking, quick-witted information for 45 minutes. Then he had to rush off to give another presentation. After today he isn’t attending the conference, but is holed up at an archive across town. Last week in Berlin, he negotiated a deal for a new batch of Danzig records. Gdansk rates having a SIG of its own due its unique history of changing national affiliations, including the interwar years as an independent city-state, and as the birthplace of the Solidarity movement that brought about the end of Communist rule in Poland. I am going to Gdansk after the conference to learn more about my family history there in the early 20th century, when it was called Danzig and was a part of the recently unified German Empire. Logan’s many research suggestions give me several new leads for my on-the-ground research beyond the family business and residential addresses that I already have. 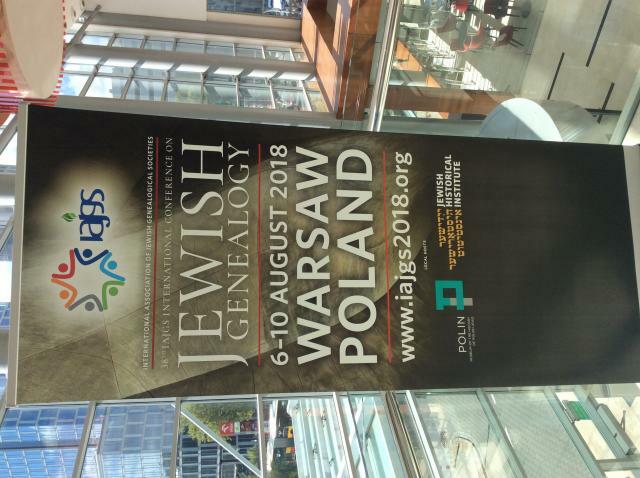 The 38th annual meeting of the International Society of Jewish Genealogy Societies kicked off last night (Sunday) in Warsaw, Poland, with a moving session featuring greetings by dignitaries including the chief rabbi of Poland, the chairman of the POLIN Museum of Polish Jewish History (a Holocaust survivor), the director of JRI-Poland (which for 30 years has led the extensive indexing of Jewish vital records in the Polish lands) and the managing director of the Polish state archives. Conference scholar-in-residence Antony Polonsky presented his views on the importance of collaboration between professional historians, who study the great historical processes, and family history researchers, who document how individuals were affected by those processes. “All history is autobiography—we aim to learn about our place in the world. Professionals like myself have much to learn from dedicated amateur genealogists,” he declared. The conference marks the first time the meeting has been held in Poland or any of the countries of Eastern Europe that was once the homeland of Ashkenazi Jewry, until that civilization was largely wiped outduring the Holocaust. 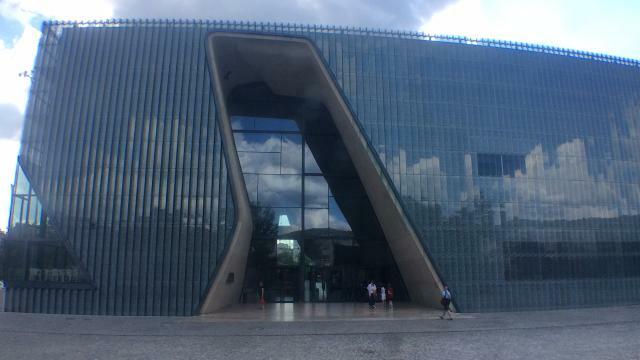 A pre-conference panel discussion at the POLIN Museum explored the fraught relationship between non-Jewish Poles and local and international Jews, communities still struggling to make sense of the terrible events that took place here in the 1940s. It also comes in the wake of a controversial new Polish law that makes illegal any assertion of Polish anti-semitism or complicity in Holocaust actions. The consensus of the panelists is that members of both groups need to make conscious efforts to break down stereotypes of the other, and to recognize the suffering that all Poles endured in World War II. Now that I am in Warsaw and the conference has opened, I will not be posting long daily posts. I’ll try to put up short tidbits on information I glean from sessions that are relevant to our family. Otherwise I will pick up again on Friday when my family search adventure resumes inStarogard and Gdansk. My main purpose was to shoot video with sound of the cemetery grounds and the Ringel-Wohlgemuth graves. I also thought I might be able to find the grave of one more Wohlgemuth, Rose, whose grave I have a photo of but no location. After shooting some video at the front gate, including of the wall I had scaled seven days earlier, I stopped in the cemetery office to see if they could direct my to Rose’s grave. I hoped that by finding her grave and maybe burial record, I could clear up the confusion introduced by Hilda’s testimony over Rose’s identity. I believe she was Isaak’s sister in law, not sister as Hilda testified. I’d been warned how unhelpful the staff in the cemetery office might be, and indeed the attendant there seemed contemptuous of my request. Finally I got him to search his database for our ancestor’s name and he relayed the information that there were three Rose Wohlgemuths buried at Wießensee. He asked me if I had a maiden name or birth or death date to narrow the search to the right Rose. I tried out the one possible maiden name that I had, Sittenfeldt, but none of the three listed that name. I had no other information other than a photo of the unadorned grave that Elly took with her in 1938. I showed it to the attendant, but that was of no help. As far as birth and death date, I had no idea. I asked if he would give me the location of all three graves but he would not do so, and acted as if it was an unreasonable request. I asked if this was for privacy reasons, but he would not give me a further explanation. Come back with more information, he said, and made clear it was time for me to go. This was a disappointment, but I can possibly follow up with the ZJ archivist who had earlier given me the burial records for our other three Wohlgemuths. For now, Rose’s identity remains a mystery. While on the subject, I will comment here on some of the errors in Hilda’s testimony. Betty’s natural mother was not Bertha Bernhardt. The records I have are quite clear that Betty and Klara Katz were both daughters of Henriette Müllerheim, but Henriette died when the girls were two and one years old, respectively, and their father Louis Katz shortly thereafter married Bertha, who raised the children as their stepmother. It seems from Hilda’s misinformation that Louis may never told Betty about her true parentage, or else that Betty did not share that information with her own children, who knew Bertha as their grandmother. That error is fairly understandable. The bigger conundrum is Hilda’s contention that Isaak had just one brother, Heinrich, as well as the sister Rose. It seems she is completely unaware of Julius Wohlgemuth, and his role in the moving business and of his wife Rose and son Leopold (or of the infant Adolf who died at a tender age, whom I recently discovered in the records. If my information is correct, and I am close to certain about it through I now have to review my exact sources, Hilda would have been just six years old at the time of Julius’s death in Stettin. So it is reasonable that she did not have a personal memory of this uncle. However, it is surprising that Isaak did not later share this part of the family story with his daughter. (We don’t know what Elly knew, but she was five years older than Hilda and would likely have remembered Julius. Did Elly and Hilda never discuss the family history in Danzig?) One detail Hilda has half right. After the sale of the moving business, the new German owner did not change the name of the company, but continued to use Julius Wohlgemuth FA [incorporated] as the business name into the 1940s. However Hilda testifies that the name of the company was I. Wohlgemuth [for Isaak], which I can show is definitely wrong. Maybe Isaak intentionally whitewashed his brother out of the family history. If so, was that to inflate his own role or merely to simplify the family story for his young daughters. You might ask, if HIlda was wrong on these accounts, is the rest of her testimony accurate? As you read, there are many fascinating new details of Isaak’s and Betty’s lives in Berlin, including his ownership of a freight company in Berlin at the Gorlitzerplatz Bahnhof and subsequent career as a marketing representative for liquor and tobacco companies. Also, she gives information about his military service in WWI that was entirely new to us. I am inclined to accept that information as true, as well as her detailed account of Betty’s life as a widow, because she was then of an age to have personal memories of all these matters. Her errors on the early Katz and Wohlgemuth history are understandable given her age and possibly the whitewashing passed down by her parents. As I commented on the video I recorded there, we don’t yet know if Hermann already lived at No. 5 before his marriage, and that he met and married the girl next door, or if he and Elly took that apartment after their marriage in 1922 in order to be close to Elly’s family. That will be interesting to learn but it awaits further evidence to decide. All my work in Weißensee proceeded quickly such that I did not have to rush to make it back to the city for my next appointment at 2:30. That’s a good thing since I did not take the best transit route to get myself the Kreuzberg where I was due to meet Donna Swarthout, the author/editor of the book about Jews reclaiming German citizenship that Joanne and I had submitted a chapter for but later withdrew. [One of the problems when traveling without cell service, is you cannot access transit directions on the fly and I did my best to get to Donna’s work location of Geneisenaustraße in Kreuzberg, but ended up at an U-Bahn station more than a mile away. I still made it to the appointment with time to spare. We met up in the cafe at the CIEE international school [for American exchange students], where Donna works as an administrator and occasional instructor. She was delightful, sharing her enthusiasm for her adopted city (she is originally a Bay Area resident). She acknowledged her disappointment that Joanne had dropped out of the book. I tried to explain Jo’s decision but Donna didn’t really buy my explanation. In the end, she found a replacement story for the book that also deals with the issue of siblings receiving a split decision on citizenship restoration The final manuscript is finished and fully edited by her German publisher. In fact, she had received page proofs only the day before and she proudly showed it to me. She also shared the information that a launch party for the publication will be held in December in New York at the Leo Baeck Institute. I wish her all success. 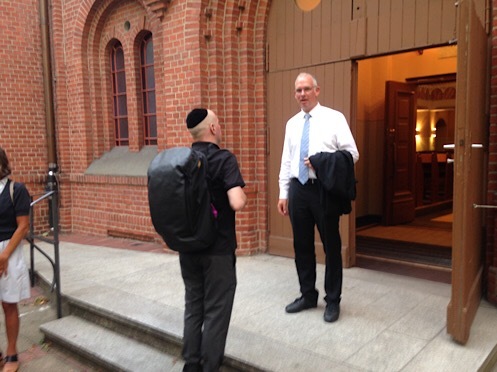 My last mission for the day and of my nine days in Berlin was to attend Friday evening services at the Pestalozzistraße synagogue. I had to explain the reason for my visit, show my passport and have my bag inspected before I was admitted. I was a few minutes late but stopped for a moment to admire the exterior of the building, visible only once you are inside the courtyard, before going inside. 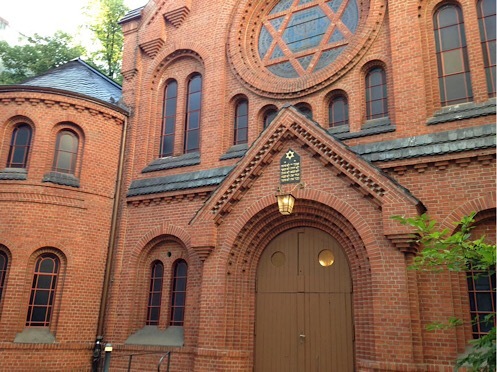 This is where Hermann attended services when it was an orthodox synagogue (Helga told Walter that Elly went instead on high holidays to the liberal synagogue on Fasanenstraße). The first thing I noticed upon entering was the organ music played by the cantor and the voices of a men’s choir, neither typically heard in an orthodox service. On the other hand, women were seated in a separate section from men, an orthodox practice not typically observed in a reform temple. Thus, the synagogue in its modern incarnation has found some kind of middle ground that works for its members. The service was quite well attended—probably 50 or so men and women. The rabbi named Jonah Sievers was a tall and clean-shaven and he exuded warmth and generosity from the bema. Unfortunately, my German was not good enough to grasp most of his message. Instead I admired the beautiful interior frescos and soaked in the hypnotic liturgical music. 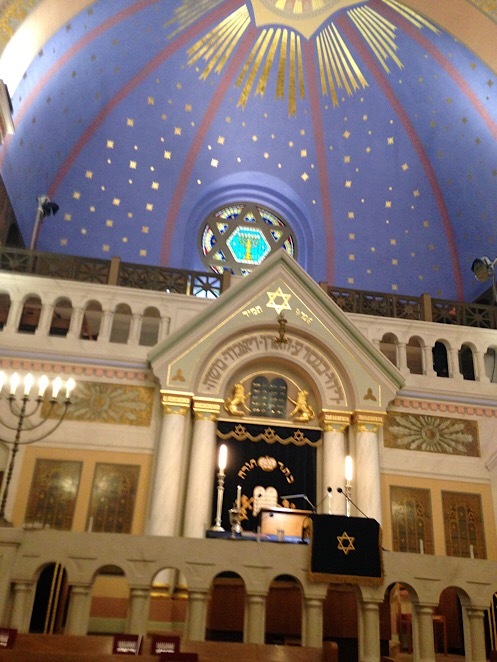 Even though I am not observant and don’t go to a shul at home, I felt moved to experience something that was an important part of my grandfather’s life. The service was not long, perhaps about an hour. After sharing Shabbat Shaloms with a number of the congregants, I lingered to have a few words with the rabbi after he finished with his post-service greetings. He did not remember seeing Joanne here two years ago. Sievers has been in the pulpit here for just about that long, so he was probably not the same rabbi Joanne spoke with then. When I explained about Hermann’s attendance here in the 1930s, he was not at all surprised by the reason for my visit. He said that quite a few people come visit for the same reason. In fact, another American, a young women from Ann Arbor, joined our conversation. Sievers said that he was originally from Hanover and that he had studied for the Rabbinate in London, after first earning a degree in (I think he said) psychology.. It seems he also has a passion for American football, identifying the Lions and the Raiders as the teams from the home towns of his American visitors. He said that he supports the Green Bay Packers because he appreciates that the team is owned by the people and not a wealthy owner. When I asked about the size and growth of the temple membership, he explained that here people are members of the overall Berlin Jewish Community, which gives them access to any of the active synagogues in Berlin. He and others I asked confirmed that there is an active renewal of Jewish life in the city, but that it would probably not ever return to the proportions from the pre-Nazi times. As for the temple itself, he explained that it had been spared in the Kristallnacht, primarily because of its proximity to neighboring, German-owned buildings. The beautiful interiors were the result of restoration work done after the war that brought back the design from before WWI. The one difference, he said, is that back then there was not the central bema that is the focal point today. All together, it was a moving experience and a fitting end to my time in Berlin. I, the undersigned, Hilda Wohlgemuth Liebman, explain the following about the life history of my mother, Betty Wohlgemuth. She was born on January 1 1875 in Kolberg, the daughter of the banker-manufacturer-entrepreneur Louis Katz and his wife Bertha Katz, born Bernhart. They were from Kolberg and were citizens of Germany. From the marriage of my grandparents, there were two children born, my mother Betty and her sister Klara, married name Jacobson. In 1897, my mother married the son of the landowner Leopold Wohlgemuth-from Stargard in Eastern Pomerania, Isaac Wohlgemuth, born October 29,1865 in Stargard. They were also German citizens. The marriage was in Kolberg following the Mosaic rite. Me mother was awarded a dowry of 80,000 goldmarks which my father used to establish his business as station forwarder in Gdansk and Stettin. My parents bought in Gdansk at Poggenpfuhl 6, where we lived above the offices in a six-room apartment. The house had six floors and is still there. The other apartments were rented. Later we lived in a luxury apartment building. We lived in pleasant prosperity and luxury. We had a horse and carriage and service staff. The business of my father developed rapidly into a very reputable company with numerous employees. My father had regular business as freight forwarder for the German and Bavarian crown prince Rupprecht. From the marriage of my parents there were two daughters born, my sister Elly and me, Hilda Wohlgemuth. I was born in Danzig in the year 1906. In the year 1911-12, my parents moved to Stettin, where the company also did business. However, we stayed there only a short time before settling in the Weißensee district of Berlin, at Wölckpromenade 6. My father sold the companies in Danzig and Stettin and kept only the one in Berlin at Gorlitzerplatz train station. As the world war broke out, my father also sold that business. The successor company kept the existing name of I. Wohlgemuth. My father was in the military and served as a non-commissioned officer. After the demobilization-he took over the general-representation of the Buchholz Cognac in Silesia-Grünberg and of cigar and cigarettes wholesalers in Weißensee. I lived in the house of my parents until to my wedding in 1928. On 14 August 1929 my father died. My mother sold a part of the furniture from the six-room flat, keeping only the most precious family pieces from Danzig and precious things from the home of her parents from Kolberg. She took an apartment consisting of two and a half rooms in Berlin at Aschaffenburger Straße no. 6. My mother’s assets included the proceeds of my father’s company, which for the largest part were in government bonds as well as in 6.5% gold-bonds, as well as other papers and cash. The gold bonds in the value of 100,000 RM was in the safe at Darmstadt National Bank in Berlin. Other assets were held at the Disconto Society, Dresdnerbank, and Deutsche Bank in Berlin, as well as cash. The interest earned far exceeded the amount my mother could spend for herself for travel, toilets, amusements, and living expenses. When her apartment on Aschaffenburgerstraße was seized by the Nazis for being “Jewish-owned” [after her death], she had in her possession 10,000 RM, as well as many as 20 gold pieces. These were to be the means to allow her to leave Hitler’s Germany. She already had a visa for Cuba in her passport, having paid $1000 for it. In addition, she also held values of jewelry in her apartment, also part of the funds needed for her emigration. My maternal grandmother Bertha Katz, nee Bernhardt, died in Kolberg (I don’t remember the year), and she left, among others, especially high-quality jewels that are incompletely listed in the filings . The records of the probate court in Kolberg may be able to confirm my information. In 1917, my father’s only brother, a bachelor Heinrich Wohlgemuth, passed away. He was the owner of the banking house and grain company Mayer & Gellhorn in Danzig. My parents were the heirs of his assets, including jewelry, artwork and master-antique furniture. In 1939, my mother’s sister Klara Katz, married name Jacobson, passed away. She was a resident of Berlin at Salzburgerstrße no. 10. Her husband had been successful as a tobacco manufacturer. They had no children and my mother inherited her assets. In 1939, a sister of my father, Rose Wohlgemuth, also died and left her assets to my mother. The list of chief objects from the apartment that I remember after so many years are provided separately, just as are the important jewelry items. I give the above statements on oath according to American and French law concerning the German criminality. They are true and accurate to the best of my ability to remember. When I arrived at the Landesarchiv on Thursday shortly after its 10 am opening, I found that there were five file folders of original documents waiting for me in the reading room. However, I first showed Carmen the long list of family vital records that I do not already have. She kindly gave me a tutorial on using the archive’s online resources to track down particular records (if you know the date and location of the event), and demonstrated that by locating one of the records on my list, the 1888 marriage certificate of Schija Ringel and Feigel Kaufler. I paid a 30€ fee that will give me access to images of any vital records I can identify and request in this calendar year. So far I have just this one, and it confirmed a few facts I knew and added some important new information. Because time is short on Friday morning as I write this, I won’t go into great detail about this or the paper files I examined (except for the one document translated in full below), but will summarize the high points. Hermann was the youngest of the three Ringel children and the only one born in Berlin. The eldest was born with the name Pessel, though she was later known as Bette, in Rzeszow on May 5, 1882. Reisl Blume, later called Rosa Schattner, nee Ringel, was born October 6, 1883 in the Galician town Podgorze, which is now a district of Krakow. The marriage record is from June 1888, and in it Schija acknowledges his paternity of all three children who had been born out of wedlock. My guess is that Schija and Feigel had been married in a synagogue in Rzeszow before the children arrived, but that the marriage had not been recorded civilly. It was to their advantage to make the union legal after they settled in Berlin. This information changes my understanding of the circumstances of their lives together. I used to think both arrived in Berlin independently, and that they met when she came to work for him as a housekeeper. Now we know that they first met in Rzeszow, Schija’s birthplace, and that they later spent time near her family home in Krakow before moving together to Berlin in 1884 or ‘85. Hermann was born in Berlin on November 5, 1885. By the way, Feigel’s occupation is given as “housekeeper,” so they may have met in the way I imagined but in Rzeszow, not Berlin. A few other items of interest in the document. Schija’s father, Moses Ringel from Rzeszow, is described as a butcher, and thus was not in the garment trade as I had speculated. Also, one of the two witnesses given in the marriage record (the other was a neighbor in their apartment building who was a fish dealer) was Schija’s brother Lieb Ringel. I can’t quite make out the spelling of his occupational description, but Carmen translated it as “slayer,” which possibly is a kosher butcher. I still have to figure that one out. But on to the main event. The five folders waiting for me in the reading room had three concerning the restitution case that Elly pursued together with her sister Hilda Liebmann and two about the anyanization of Hermann’s two businesses. As I said in yesterday’s post, I was surprised to learn that the restitution did not concern Hermann’s business interests but was all about the considerable assets left by Betty Wohlgemuth. The archive has an obnoxious policy of not permitted documents to be photographed. Instead you have to order copies to be made at half a Euro per page, which can add up and which takes several months to arrive. When I came across one critical document, a lengthy affidavit with details of family history submitted by Hilda in 1958, I tried to surreptitiously snap a couple of images and was given a serious scolding by the reading room attendant. So I spent more than an hour carefully typing in the text of Hilda’s statement and then using Google Translate to work out a rough translation. I will reproduce that in full in a separate post after this one. In it, I believe Hilda has a few facts wrong, but there is much new data that paints a picture of Betty Wohlgemuth’s privileged life and sorrowful end. This is just three pages of more than 100 in the file that I was able to capture. Most of it concerns Betty’s jewelry collection. For example, there is another statement by a close friend of Betty’s who says they attended concerts and the theater together and is able to remember specific details about Betty’s jewels. I submitted a request to have the entire file scanned, which will end up costing about 60€, but it is the only way I will be able to later study the file in depth. I also ordered a few of the pages from the Ringel aryanization files, but decided not to ask for all of it. I’ll just cover a few of the revelations here. On the subject of Hermann’s business partner, there were indeed two of them, one for each of the businesses. Isser Reichenthal was the senior partner in Reichenthal and Ringel, first registered in the Berlin commercial registry in 1919. Erich Ignaz Wasserreich was the junior partner in Hermann Ringel & Co., which was registered in 1924. I can’t yet say for sure, but I think the likely culprit in the theft of Hermann’s escape money was Wasserreich. There is not a lot of detail about the operations of the companies. Most of the contents are from 1938 to 1940 and concern the forced sale and subsequent dissolution of the companies under the Nazi aryanization laws. They fill out the details behind the short listings I had previously obtained from the Database of Jewish Businesses in Berlin. Here I will review the chronology of events concerning the H. Ringel & Co. business. As I mentioned, the firm was registered as Hermann Ringel & Co. in 1924 and given the registration number 66805. After Hermann’s death, Wasserreich changed to Ringel & Co.and obtained a new registration number. Then in April 1939, Boucher writes again to say that the assets of the firm have been auctioned off to satisfy a tax debt. These tax debts for the business and the home were likely a special Nazi levy against Jewish businesses and individuals. Following that, Boucher declares that the firm is now “geschlossen”—closed. That’s the gist of it. The other business had already be dissolved by this time, with no intermediate transfer of ownership. There is much more to glean from a closer inspection of these files. I hope that the selection of pages that I ordered will let me do that without the pressure of time. Check out the following post for a rough translation of the full text of Hilda’s sworn statement about Betty’s estate. 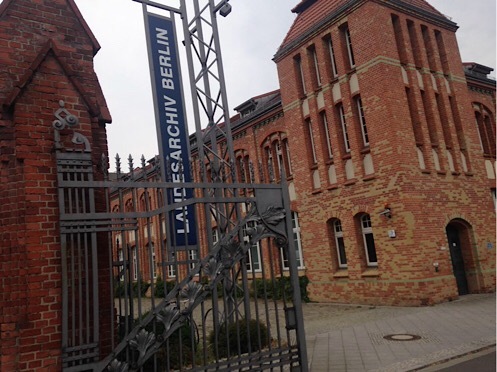 I arrived about noon at the Landesarchiv-Berlin in the north of the city, which I thought would give me ample time to search their records. It turns out that I should have been there before 11, which is their cutoff time for ordering records for same-day access. The good news is that they do have the files related to the Database of Jewish Businesses of Berlin. A young women named Carmen was super friendly and helpful, and was able to locate the record numbers for the two Ringel businesses. She helped me to fill out a record request to access the files, which will be ready for me to view when I come back tomorrow. The archive has several other collections that are relevant to our case. The first are files related to restitution cases for dispossessed Berliners. She quickly located the database record for Elly Ringel geb. Wohlgemuth, but there was a surprise. The case relates to the estate of Betty Wohlgemuth and has nothing to do with the Ringel businesses. Carmen didn’t know why Elly did not file an action related to the businesses, but she speculated that companies like Hermann’s may not have had a lot of hard assets. It is harder to put a value on customer relationships and business reputation. There is another avenue for inquiry on this. I know the name and address for Elly’s lawyer who handled the case in Munich, but I did not bring this with me. I can follow up with that firm after I am back home. The other collection of interest at the Landesarchiv is its main reason for being. It holds all vital records of sufficient age for residents of Berlin. Birth records less than 110 years old, and marriage and death records less than 70 and 30 years old, respectively, are held in the local registry offices where they were originally filed and are not available to the general public for privacy reasons. I already have a number of our relevant records, but there are others such as Schija Ringel’s marriage and death certicate, plus anything on Hermann’s two siblings and their children, that are not in my collection. To locate these records, one still has to know the date of the event and the registry office location (based on the person’s residential address). Some of this information may not be readily available to me before I return to the archive-tomorrow, but I have hopes to at least find the death record for Schija Ringel, which might then lead to his burial location. That’s it for today. Crossing my fingers for a treasure trove of new information tomorrow.